Veneers are thin, custom-made shells of porcelain designed to bond to the front of the teeth in order to improve the appearance of your smile. Veneers are cosmetic treatment ideal for fixing gaps between teeth, and cracked, chipped, discolored or misshapen teeth. It usually takes three appointments for the entire treatment which includes consultation, the preparation of teeth and veneers, and bonding. During the consultation, our dentist will take time to answer all your questions and make sure dental veneers are the best option for your needs. To prepare your teeth for the veneers, our doctor will lightly file the surface of the teeth removing thin layer of enamel. Next, the impression of your teeth will be taken and sent to the dental lab where we will have your veneers made. Until your new veneers are ready, you might have temporary veneers placed over your teeth. After a week or two you will return to the office to have the veneers placed and permanently cemented to your teeth. You might be asked to return to our office for a follow-up in a couple of weeks to check how your gums and mouth are reacting to your new veneers. 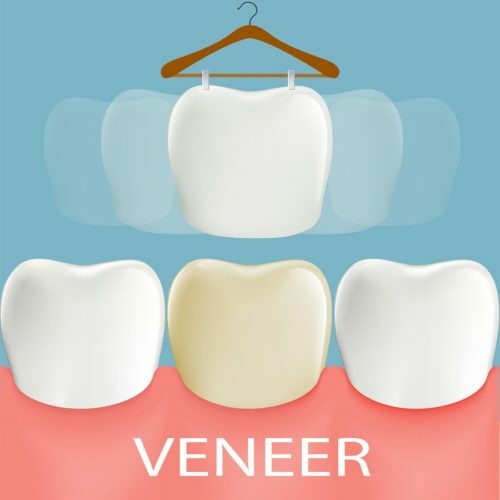 Maintaining your new veneers is quite simple! Care for them as you would for your natural teeth, brush, floss and rinse regularly! Also, do not forget to stop by our office for professional maintenance and cleanings. Veneers are thin, custom-made shells of porcelain designed to bond to the front of the teeth in order to improve the appearance of your smile. Veneers are cosmetic treatment ideal for fixing gaps between teeth, and cracked, chipped, discolored or misshapen teeth. It usually takes three appointments for the entire treatment which includes consultation, the preparation of teeth and veneers, and bonding. During the consultation, our dentist will take time to answer all your questions and make sure dental veneers are the best option for your needs. To prepare your teeth for the veneers, our doctor will lightly file the surface of the teeth removing thin layer of enamel. Next, the impression of your teeth will be taken and sent to the dental lab where we will have your veneers made. Until your new veneers are ready, you might have temporary veneers placed over your teeth. After a week or two you will return to the office to have the veneers placed and permanently cemented to your teeth. You might be asked to return to our office for a follow-up in a couple of weeks to check how your gums and mouth are reacting to your new veneers.